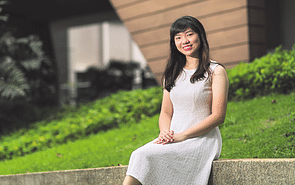 When applying for scholarships after receiving her A-level results last year, Miss Cheri Tng Jing Ying zeroed in immediately on a National University of Singapore (NUS) scholarship. “It was the first scholarship I applied for as it was the one I was the most interested in,” says the Temasek Junior College alumnus. The NUS scholarships first came to her attention when she chanced upon a survey placing NUS at the top of a list of preferred scholarship providers. “That sparked my interest and motivated me to find out more about the scholarships offered by NUS,” she says. 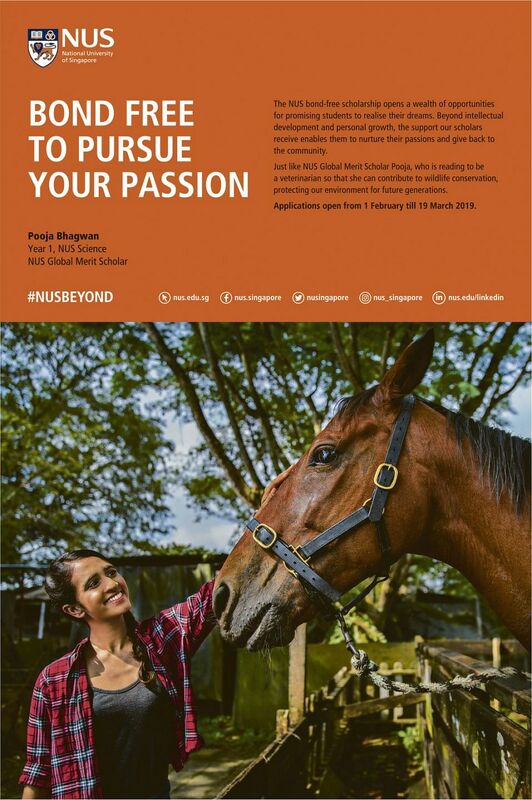 NUS offered her its Global Merit Scholarship and she also received a scholarship offer from another institution. She picked NUS. She went through a two-stage selection process to secure the NUS scholarship. First, she took a general knowledge test, a case study and participated in a board room discussion to determine if she made the cut for the NUS Merit Scholarship. Then she was shortlisted for the next stage — a panel interview to assess her suitability for the higher-level NUS Global Merit Scholarship. Both scholarships — Merit and Global Merit — are bond-free, cover tuition fees, and provide an annual living allowance and a one-time computer allowance. Recipients are also eligible for the NUS Scholar Enrichment Grant, which funds 50 per cent of the scholars’ participation in short local or overseas enrichment programmes. The Global Merit Scholarship has additional benefits, like an annual accommodation allowance and a Student Exchange Programme/ NUS Overseas Colleges allowance. “NUS scholarships offer a plethora of different opportunities for me to explore my interests and to gain exposure, especially with the financial support to take part in these activities. The NUS Global Merit Scholarship, in particular, supports learning on a global scale by funding overseas exchange programmes,” says Miss Tng. Another benefit of her scholarship is the eligibility to enrol in a funded residential programme. 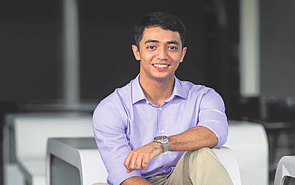 The 19-year-old is now staying at Residential College 4 in University Town while studying at the NUS Business School. The residential colleges at NUS blend student accommodation with an academic programme. “This allowed me to explore modules and learn about new things and concepts beyond business,” she says. She has taken a module on Sport and Competition and another on Population Dynamics at her residential college. “The interesting module about Sport and Competition delves deeply into various issues encompassing the topic — a topic I would have never thought of reading up so much on, yet learn so much from,” she says. Besides time spent on studies, Miss Tng has also been busy with various extra-curricular activities in her first semester at NUS. As a Bizconnect Business Relations Executive with the NUS Business Administration Club, she organised networking dinners. She was also involved in an International Service Programme in Laos, which raised $6,000 to build classrooms and purchase necessities for students of a secondary school there. They also spent a few days engaging in activities with students of a school for the hearingimpaired. For this project, Miss Tng did not apply for the Scholar Enrichment Grant that she is eligible for under her scholarship. However, she intends to do so for future overseas programmes. She aims to make full use of the opportunities available to her to enrich her business education at NUS. “In essence, business is everywhere. In order to connect the dots, I realised the importance of being open to new ideas and observing the world around me more,” she says.